I didn’t spend too much time working this year. Don’t get me wrong – I worked a lot, but speaking of the typical, freelance/commercial stuff, maybe for a quarter in total? For the rest of the time, I was spending the money that I saved up in the past years and dedicated this time purely for speaking up during meetups and workshops through all of Poland. And even most importantly, I chose to develop our own “after hours” open source projects as I believed that it would be worth it. However, speaking of the regular work, I’m happy to say that at first, I worked with the Nexta (they found me thanks to this article). After a month or so, my colleague Grzegorz joined, and we worked together for them – later on, I decided to drop the job and focused on the .NET Core Tour as well as developing the Collectively, while Grzegorz gathered up with his friend Kamil, and now they continue the development, well-done guys. Starting in October, I joined the Verve Industrial team – again, they found me thanks to my GitHub projects and so far I’m delighted with the collaboration. I remember as if it was today – March, some Sunday and I was supposed to give the final answer by Monday, whether I want to join one of the best programming schools here in Poland to prepare the .NET course from scratch. That was indeed a difficult decision, as I fancied teaching the people programming in general, yet on the other hand, I didn’t crave to make this my full-time job. And exactly then, a friend of mine Łukasz asked me, if I want to join him and travel via all of Poland and speak about .NET Core. Without giving it a second thought, I decided to drop the job at programming school and join Łukasz. That was an exceptional experience, I encourage you to read about it here. 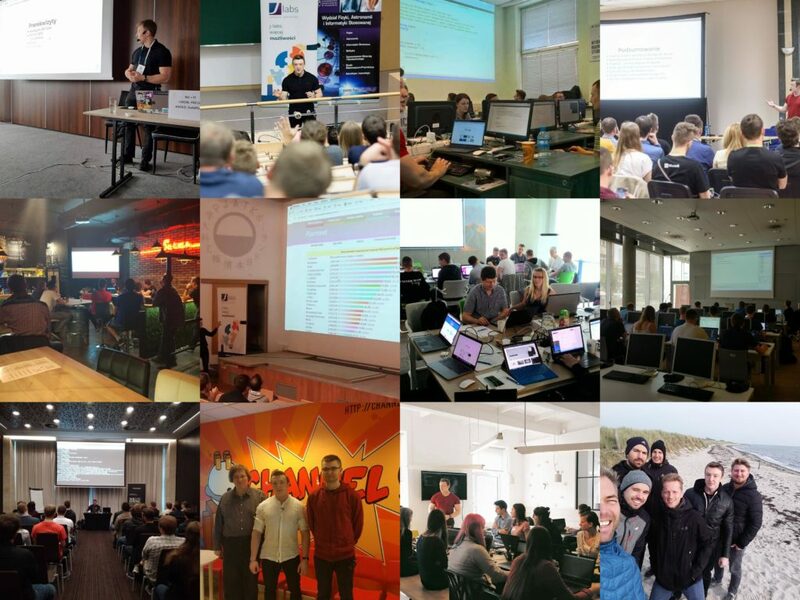 Besides the .NET Core Tour, I was also a speaker at some well-recognized conferences, such as 4Developers (both, in Warsaw and Gdanśk) and a few others. Again, such a neat experience that gives you even more confidence. Speaking from personal experience, start small, with local groups or meetups and then go to the big conferences like these. Starting early this year, by giving the first workshops ever for the WiT (Women in Technology) group, I discovered that it’s something that makes me happy. I never thought that teaching the others, whether about the programming basics or more advanced topics might be such a remarkable experience. I ran the whole day seminars both, solo and also with Łukasz during the .NET Core Tour. I also had a chance to do some paid workshops, for the companies such as Microsoft. Eventually, with a friend of mine Paweł, we were given an opportunity to run the postgraduate studies, strictly about the .NET Core and programming basic. Moreover, I also became the mentor in the 3rd edition of TechLeaders. Before I started doing the regular workshops, I created the “Becoming a Software Developer” course, which received a lot of positive feedback. Later on I was asked by different companies to record some paid courses, and eventually, I created 3 of them. One in Polish and remaining 2 in English, you can find the links for all of the sessions here. I also started publishing more video content to my YouTube channel and realized that Snapchat is also a pretty handy tool. Feel free to follow me (spetzu) and the rest of the developers. am proud to say that after spending a year (me and a friends of mine) on the rather typical, open source and after hours project named Collectively, we managed to get it up and running here in Kraków. On top of that, we were chosen as 1 of 3 projects that will receive money funds to develop the Blockchain technology underpinned to our application. You can find more about the Collectively on it’s landing page and in the social media (yes, there was even a press conference). Pretty much all of the code I do write nowadays is fully open source and can be found on my GitHub profile (or the Noordwind one or any other organization that I’m part of). I will continue doing so, especially now, given that we’re going to develop Collectively for real, in a group of 8-10 people. Almost 2000 contributions this year, and I ain’t gonna stop that flow. Since I’m one of the 4 co-founders of Noordwind, I’m very happy to announce that we started to grow as the teal organization. Few more members joined us (friends and friends of our friends), and even though we’re usually working with different customers and on different projects, we still manage to find time to talk regularly about organizational stuff, think about next steps and so on. We’re more like a network of developers and other skilled members being able to deliver software services (but not only these). I wish that we will continue the growth exactly this way. At the beginning of the December, I was awarded Microsoft MVP (not LeBron James) as one of the 3 members of this part of Europe. Thank you very much, Microsoft, for such reward! Although I’m not a part of the C@C team, I must admit that I’m very glad to be a sort-of catalyst that gathered up its 2 core members (Tomasz & Tomasz). It’s astonishing that starting from scratch, a group of 5 people managed to deliver one of the most popular Meetup groups here in Poland, having on average 150 members per event just in Kraków. Good luck in the future guys, with delivering the great content about Blockchain and cryptocurrencies. Most likely I forgot about something, but that doesn’t really matter. As you can see, I do a lot of different things, as it keeps me motivated and happy. I always wanted to be fully independent at some point which basically means having my own projects that I could develop and benefit from. I do believe, that 2018 is going to be the year dedicated to such activities. I do not want to make any commitments here, as you never know whether your idea will work out. Nevertheless, if you never try you will never find out, so just wish me good luck, and see you in 2018! Do you have any plans for some course / tutorials / series in the upcomming time ? Or maybe you are already creating something ? Together with my friend Darek, we want to create the series about .NET Core microservices, so stay tuned. Hope you have great summer to do your plan. Chciałbym zapytać od jakiego usługodawcy do hostingu korzystasz ? Masz VPS czy cały serwer ? Jesteś w stanie coś stabilnego polecić ?